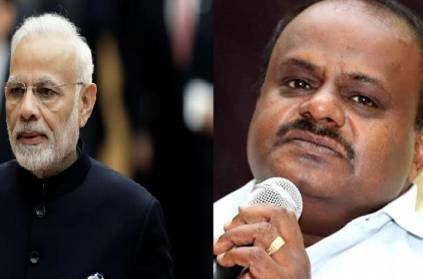 A week after Karnataka CM, HD Kumaraswamy alleged that PM Narendra Modi does "makeup" to get glow on his face so that he looks good on camera, former BJP MLA Raju Kage mocked HD Kumaraswamy for his complexion. HD Kumaraswamy has said last week that Modi applies makeup or wax to get a shine on his face before appearing in front of cameras. He added that, "As we take bath once in the morning and wash our face only the next day, our faces do not look good for cameras. That's why even the media shows only Modi." Responding to HD Kumaraswamy's "cosmetic" remark, former BJP MLA Raju Kage said Modi is fair and Kumaraswamy is dark. He said, "Kumaraswamy says Narendra Modi applies powder 10 times and changes 10 clothes in a day. Arre, Modi is fair and good looking. Kumaraswamy, even if you bathe 100 times, you will be like a buffalo," as reported by India Today. This racist remark has stirred a row. Politicians stooping low to remark on complexion and makeup has upset people. According to IBT, the former BJP MLA was once booked for allegedly assaulting a businessman from Ugarkurdh KH village in Raibag taluk for posting a defamatory comment against him in his Facebook account. Karnataka will vote on April 18 and 23 in the seven-phase national election that starts tomorrow (Thursday). The results will be declared on May 23. This page contains news relating to various facts and events. The views are generally about current affiars and general topics in diversified areas such as political, international, national, and regional issues, sports, health, travel, lifestyle, technology and business. People having similar interets on the above topics will find this page useful. Former BJP MLAs racist remark on HD Kumaraswamy | India News.